Established in Sydney, Juv’ae offers non-surgical solutions including dermal fillers and anti wrinkle injections to help our clients optimise their appearance and confidence. 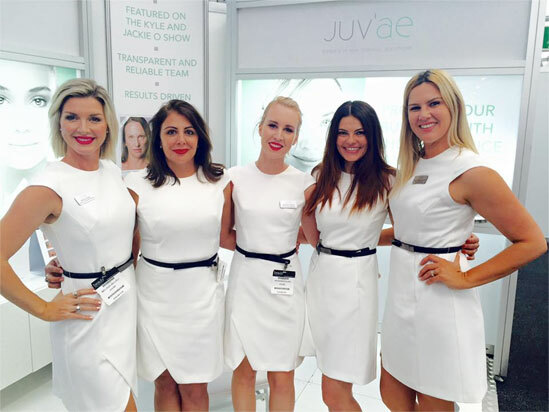 Juv’ae’s experienced specialists attend salons and clinics throughout NSW, Victoria and Queensland to bring our quality techniques and technology directly to you. You can be sure that you’re in safe hands, because our injection specialists and medical staff undergo extensive and regular training by the world leaders in medical aesthetics. We take time to help you understand the options and keep you informed at every step of your treatment. For, long lasting and effective results, look to Juv’ae. At Juv’ae we are dedicated to devoting personal attention to each client and the highest level of aesthetic expertise. This is demonstrated in the quality of our exceptional products, our regular training and crucially, our experienced and passionate team. Everything we do centres around providing a welcoming and professional environment for our clients, developing optimal results whilst ensuring safe and responsible practice at all times. We bring our services to you, making our treatments accessible in all areas, and all at very competitive pricing – because everyone has the right to look and feel their best. Make a booking now to visit a Juv’ae specialist near you and to develop a personalised treatment plan. For luscious lips, defined cheeks and plump youthful skin. Dermal fillers help to hydrate and restore volume to cheeks, lips, chin, nose, lower face, jaw, hands and around the eyes. Your secret weapon in keeping unwanted wrinkles and lines at bay. Anti wrinkle injections offer an affordable and fast-acting method to control facial wrinkles, frown lines and fine lines. They reduce wrinkles caused by the continual and repeated contraction of the tiny muscles of the face, which wrinkle up the overlying skin. The anti-wrinkle injection blocks the signals muscles, which ultimately allows the skin to relax. Anti-wrinkle injections are particularly effective in treating a specific type of wrinkle. If you have deep frown lines or forehead or crow’s feet , anti-wrinkle injections may produce best results for you.